Mother’s day is soon to come and many big stores including Giant Tiger dropped their prices. Today on Giant Tiger Flyer May 11 2017 there are many big deals and discounts just for this special occasion such as snacks, condensed foods, drinks, care kits and many more. Giant Tiger serves you many items on countless categories so do not forget to check this flyer before buy anything. For example there are many special products in clothing category for your mother such as off shoulder blouses, dresses, v neck tunics and many more. You can always find a good gift for your mother with today’s Giant Tiger Flyer May 11 2017. Now let’s see the big deals both on kitchen supplies and gifts for your mother. 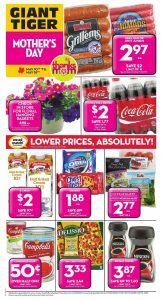 Today’s Giant Tiger Flyer May 11 2017 has many good deals on drinks, foods, conserved goods, snacks and many more so if you are looking for re-supplying your goods then with today’s flyer in your hand, you can save big time. This deals are available only to May 16th. so be quick and claim all you want while you can. Now, lets see the best deals ! Remember, you can always see all deals on today’s flyer by just clicking the right hand sided image. Floral Hanging Baskets, $8.98 ea. Coca Cola Drinks, $2 ea. Today’s flyer is the one of the best source for you to find the best gift your mother. 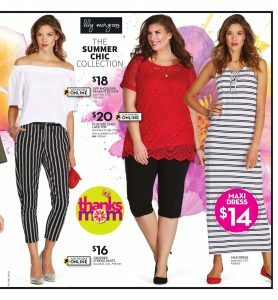 In today’s Giant Tiger flyer there are many good options for you to buy dresses, v neck tunics, blouses etc. The best new is, all of those items are in big discount so be quick and grab one while you can. This might be your last change to find your mother a perfect gift. These are the best deals on today’s flyer but you can always find more deals and discounts with simply subscribe our news teller. You can also be alerted when the new flyer is out so with subscribing our news teller, you can always be up to date. See you on next deal !